Not landlocked Hungary the EuropeanStill famous for its numerous resorts, among which there is a beach. Rest and treatment is made on the lakes and thermal springs, which brought the country worldwide fame. Thermal Hotels in Hungary are scattered throughout its territory, and even in the capital city of Budapest can be found open baths, where people basked in the warm therapeutic waters. The name of the first resorts difficult to utter, butthe use of "hot gold" of its thermal waters is beyond description. Here, in the truest sense of the word, put on the feet of patients with rheumatism and help find happiness of motherhood, even those who have already despaired. Hundreds of medical procedures and manipulations - in the arsenal of the doctors of local health centers, and young patients can spend your free time in the modern town water park. The unique natural lake Hévíz - the biggestfrom warm-water reservoirs in the Old World. Healing effect provides the water is supplied to the surface from underground springs and has a temperature of about 30 degrees year round. The list of ailments, forgotten at Heviz, perhaps the most impressive, even against the background of the other features of Hungary resorts. In addition to thermal water, doctors and beauticians in spas Hévíz successfully use healing mud from the lake bottom. 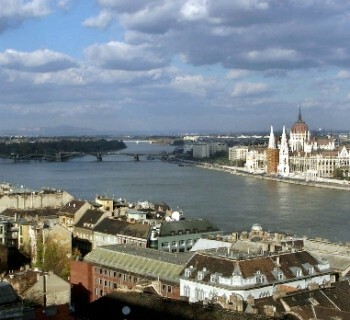 In the heart of Budapest on the Margaret IslandHe spreads a favorite with locals and tourists resorts of Hungary. As many as three thermal springs provide the water used for the treatment of diseases of the gastrointestinal tract and nervous system, gynecological and endocrine disorders. In the hospitals of the island is easy to get rid of excess weight, cellulite and swelling, to withdraw toxins and find a good mood. As a place for rest and walking islandMargaret does not fit less. There are beautiful parks, built a water slide, an outdoor pool and tennis courts. In the evenings, arrange concerts and performances in the summer theater, and restaurants of the Hungarian resort is to taste the famous goulash and real Tokay wine. No beach holiday Hungarians also did not stay onthe banks of the largest in the center of Lake Balaton in Europe are equipped with a comfortable place for swimming and sunbathing. Resorts of Hungary, located on the southern shores of Lake Balaton, more suitable for families with children, as the bottom is flatter. On the northern resorts of Zanka and Tihany rocky shore and the rocky bottom is cut off pretty cool. This area was chosen for recreation youth and experienced swimmers. Where better to relax in Hungary. Where to go in Hungary?